The top challenge for recruiters is to entice high-quality and talented candidates for their open positions. Recruiters and HR managers need to develop quick strategies to find, interview, and screen top candidates faster. Recruiters can leverage talent acquisition strategies to get positive results from their hiring processes. The faster you speed up your hiring process, the faster your company will grow. 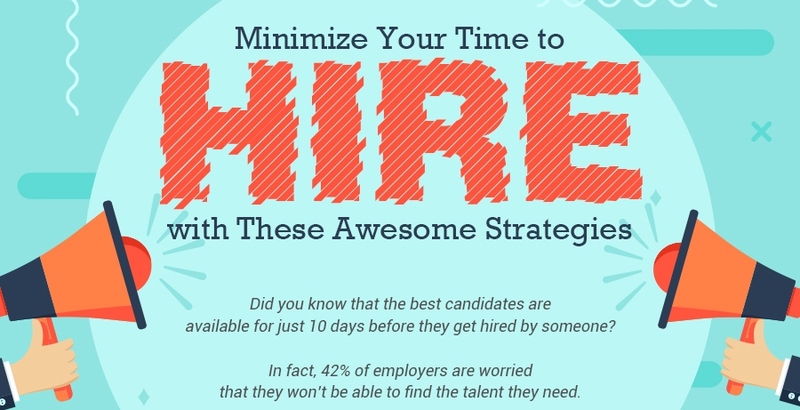 Let’s take a look at a few simple recruiting hacks and strategies that can help you cut down your time to hire. Passive candidates do extensive research before switching jobs. And 92% of passive candidates will switch their jobs only if a reputable company offers them a job. You should focus on building a powerful employer brand by responding to online reviews. You can also provide your employees with a fulfilling work environment to encourage them to write good things about your company. Building a good reputation can help you engage a pool of talented candidates for your company’s open jobs. A good job description will attract better quality candidates for the job. Most candidates will get frustrated if they don’t find clear roles and responsibilities in the description. Recruiters should always mention the qualifications and skills they need in a candidate in their job descriptions. This can help you ensure that you get applications from qualified candidates only. You can then choose the best ones from among these applicants. Audit your existing employees for their skills and experience to save time finding suitable candidates. Stay up-to-date about the performance of each of your employees so you’ll know who can be promoted or reassigned to an open position. You should also keep track of those employees who want to switch roles. If you identify that any of your experienced and knowledgeable employees are willing to switch, you can promote them internally to the vacant higher-level positions. This way you can save yourself from losing your top talent.